Canoe, row, sail* or motor any of these six models. It's 4 boats in one! Available colors: Birch bark ivory, Forest Green or olive (shown below). two paddles with oarlocks for rowing! 12' Pointed model shown above in olive color with Foam seats; [also available in Forest Green with wood/web seats]. 14' Pointed model in Forest Green color shown above with foam seats; [also available with wood/web seats]. *foam seats shown; [also available with wood/web seats]. Shown above in camo color with foam seats [also available with wood/web seats]. Available colors: Birch bark ivory or Forest Green. Wood/lace seats and Birch Bark ivory color shown above; [also available in Forest Green with wood/web seats]. more strict than US or Canada Coast Guards and much more strict than the 6" freeboard capacity rating most canoe manufacturers use. If rated by the 6" freeboard method capacities and motor ratings would be higher but less realistic. 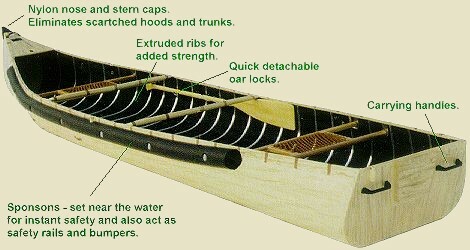 Under this system, "Wide Transom" canoes are more conservatively rated for the US market than they are for the Canadian market.